Thomas Rowell was born in 1594 in Atherstone, in the parish of Mancetter, Warwickshire, England. He was the son of Valentine and Elizabeth Hampton Rowell. Valentine was born probably 1565/1570 and died in 1613. Elizabeth was buried in 1647/48. The family lived in the village of Atherstone, which is about 10 miles north of the city of Coventry. In those days Atherstone was much smaller than Mancetter and had no church. Thomas married for the first time in St. Peter's Church, Mancetter on 12 October 1615, his wife was Margaret Milner. St. Peter's Church was old even then. The church was begun in 930AD, the main section of the church that we see today was begun in 13th century with the bell tower being built in the 15th century. The church and the almshouse next door would have been a familiar sight to Thomas Rowell and his family. Mancetter was not mentioned in the doomsday book, but it has a long history. The Roman road, Watling Street forms its Northern boundary and the Romans built a fort or staging post here. In the 4th Century AD it was called Manduessedum. In fact it is believed that Boudicea, the Ancient British Queen fought her last battle against the Romans somewhere between Mancetter and Hartshill. Mancetter was famous in Valentine the elder's time for being home to two Protestant Marytrs who were burnt at the stake during the reign of Queen Mary. Robert Glover was the educated and wealthy owner of the 14th century Manor House in Mancetter. He was educate at Eton and King's College Cambridge. He became interested in Protestant Theology during the reign of King Henry VIII. He was burnt in Coventry 19 September 1555 for heresy. Joyce Lewis of Mancetter was burnt at Lichfield in December 1557. It is entirely possible that these deaths weighed heavy on the minds of Thomas and Valentine as they embraced the Puritan faith and swayed their decision to come to America. Ordered that Tho. Rowell of Salisbury, having used all proper means to fetch over his wife from old England, and she being disenabled by sickness to come at present, shall not be constrained to go over to her at once, only he is to use what means he possibly can to get her over. Thomas and his son Valentine came to the Colony in 1638/1639, Thomas would have been about 45 years old and Valentine less than 20. It is not known on what ship they sailed or where they first landed. 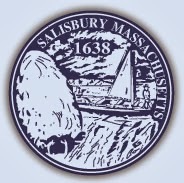 They were however among the first settlers in a new plantation eventually called Salisbury. The town of Colchester, soon after named Salisbury, Massachusetts, was chartered in 1638, and, in the first division of land there, Thomas Rowell received a house lot and forty acres. The original roads at the center of the town formed a compact semicircle, which allowed the residents to quickly reach the garrisonhouse in case of attack. Those roads still exist, though the shape today is triangular, being bounded by Elm Street, School Street and Bridge Road. Thomas became a large landowner in the town and he bought and sold land throughout his life. He was a carpenter by trade but he and most of the townsmen were also engaged in making pipe staves. 1645 he was fined two and one-half pounds for using more than his share of the common timber for making staves. 1648 he was fined five shillings and two pence for non-attendance at public worship, at the same time that John Bournd was fined for selling strong water, from which it may be inferred that Rowell was somewhat inclined to be convivial, though he must have overcome his appetite later, as we find him a deacon of the church at Andover. 1651 he married Margery Fowler Osgood, widow. She was born 1615 in Marlborough, Wiltshire, England, daughter of Philip Fowler, a cloth worker, who was born 1591. There she became the second wife of Christian Osgood of Ipswich, with whom she embarked, March 24, 1634, for America. His third marriage and her second. Thomas adopted her children at that time. 1653 Thomas and Henry Pinder, were sued by the city of Ipswich for failure to finish building a prison house. 1654 he was fined for taking tobacco out of doors and and near a house. His wife was admonished for cruelty. 1656 on behalf of his stepdaughter Abigail Osgood, he sued Frances Leach for having slandered her by saying she was with child. The charge was withdrawn. 1656 birth of his son Jacob, Thomas is 62 and Margery is 41. His will, proved September 30, following his death, was made February 24. 1651, and on the same day he entered into an ante-nuptial agreement with Margery (Fowler) Osgood, by which he bound himself to bring up properly her two daughters by a former marriage. 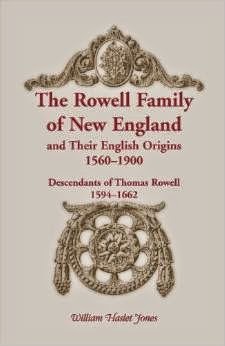 After the death of Thomas Rowell, her second husband, Margaret Fowler Osgood Rowell married Thomas Coleman of Nantucket, who died in 1682. Her fourth husband was Rev. Thomas Osmond, a Baptist clergyman, who was forced to flee from the Massachusetts Bay colony by the intolerance of its citizens and took refuge at Nantucket. She survived him, and died at Andover, November 20, 1701. She was administrator and guardian of numerous children, of her own and her several husbands by other wives, and seems to have been a person of strong mental and physical powers. The records preserve the names of two sons of Thomas Rowell, Valentine and Jacob, the latter the son of Margary (Fowler) Rowell.